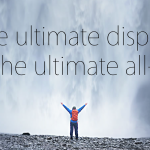 Apple’s iPad Air 2 will feature an interesting new piece of technology for buyers of the cellular-enabled model. The Apple SIM will allow users to select from a number of different carriers and plans in both the United States and United Kingdom. 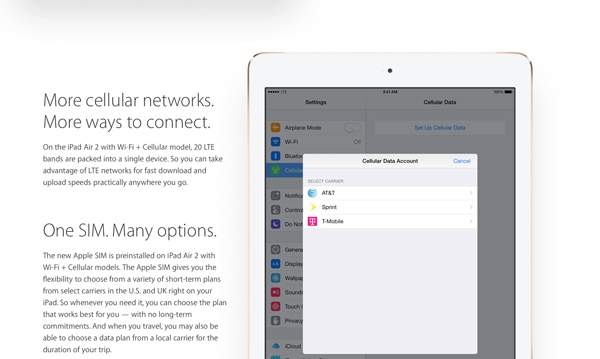 As you probably know, unlike iPhones, data service for iPads doesn’t require any long-term contracts, and this will give users the ability to select the plan that works best for them. At least in the U.S., the feature will be supported by AT&T, Sprint, and T-Mobile. Verizon users will be out of luck. In the UK, users can select data from carrier EE. Apple said that while traveling, users may be able to select a data plan from a local carrier for the duration of their trip. So that hints Apple may expand the number of available carriers for users to select from over time. More information about the new SIM can be found on Apple’s site here. The new iPad Air 2 was announced at a media event earlier today. Along with a thinner profile, the tablet offers a Touch ID sensor and a number of other improvements, including a faster A8X chip. The cellular-enabled tablet will start at $629. Preorders start tomorrow. The tablet will be available to purchase next week.